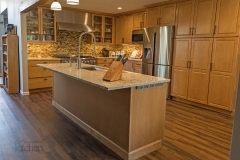 Lake Forest Kitchen Personal Touch | Le Gourmet Kitchen Ltd. This transitional kitchen design in Lake Forest is packed with professional quality features interwoven with personal touches that bring out the personality of the homeowner. Earthy tones feature throughout this kitchen design from the ceiling beam to the raised panel kitchen cabinets to the multi-toned glass mosaic tile backsplash. 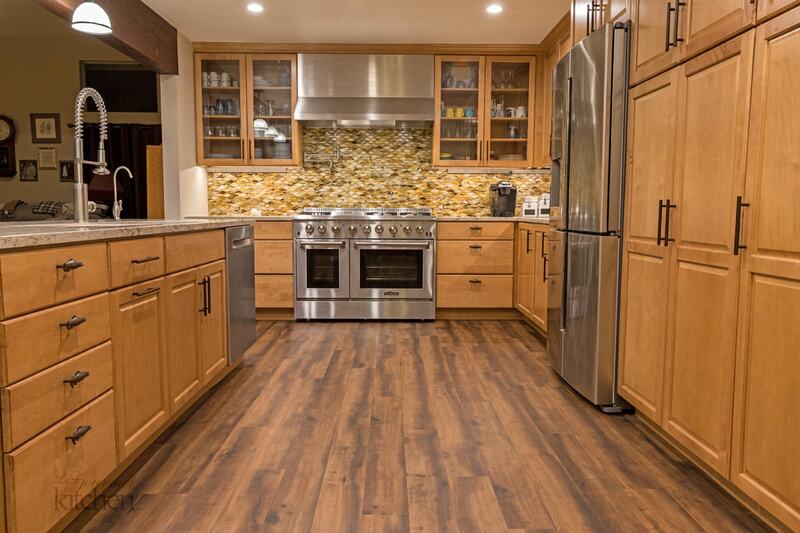 This gives the open plan kitchen a warm appeal that will make it the center of life in this home. 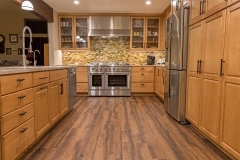 A luxury vinyl tile floor pulls together the space with an easy to maintain material with the look of hardwood flooring. 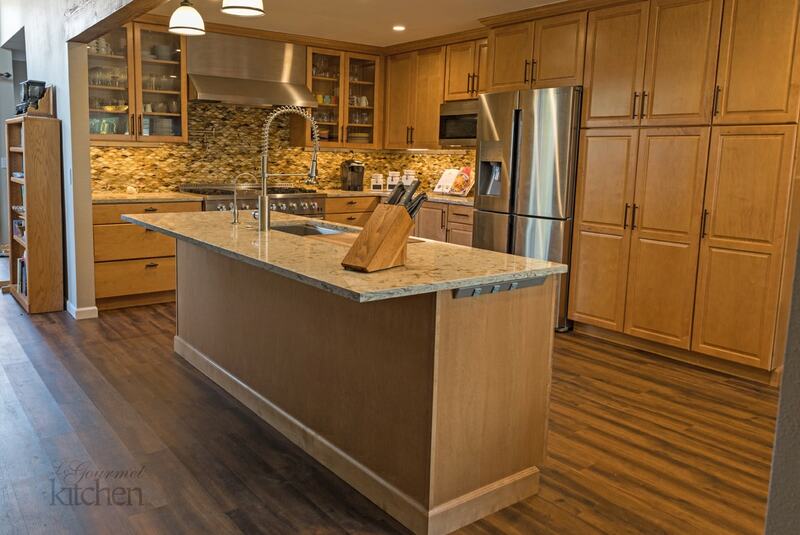 Upper glass front kitchen cabinets add light and depth to the room and offer space to display glassware and dishes. The cabinetry is offset by an engineered quartz countertop and cabinet hardware that includes unique fish-shaped drawer pulls. 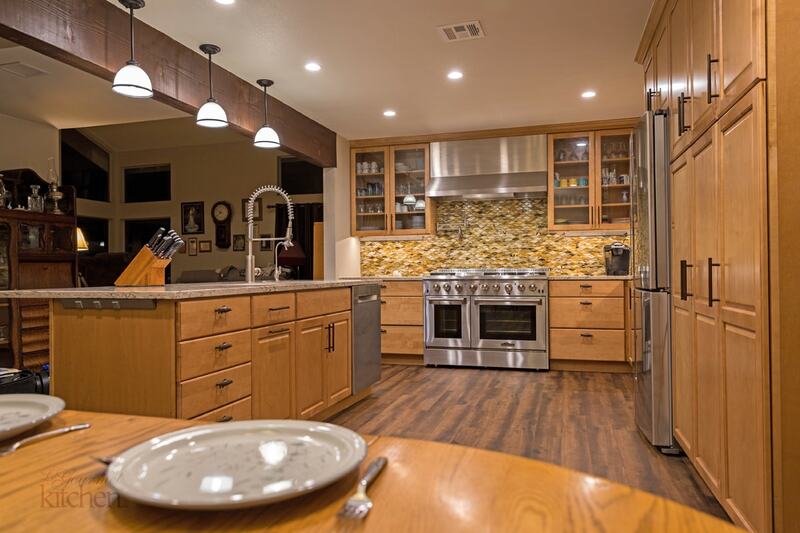 This adds an eclectic edge to the kitchen design and brings out the personality of the homeowner, who is a fisherman. 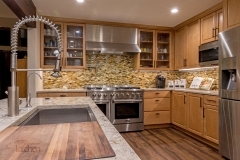 The kitchen remodel also brought in professional quality appliances, creating an ideal space for an avid home chef to create culinary masterpieces. The Thor professional oven and range combined with a Vent-a-Hood range hood and a pot filler faucet offer the perfect space for day-to-day cooking or creating special meals for family and friends. 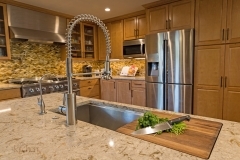 A large Kohler Stages stainless steel Chef’s undermount sink in the island pairs with a Grohe pull down sprayer faucet, offering ample room for everything from preparing food to cleaning large pots. 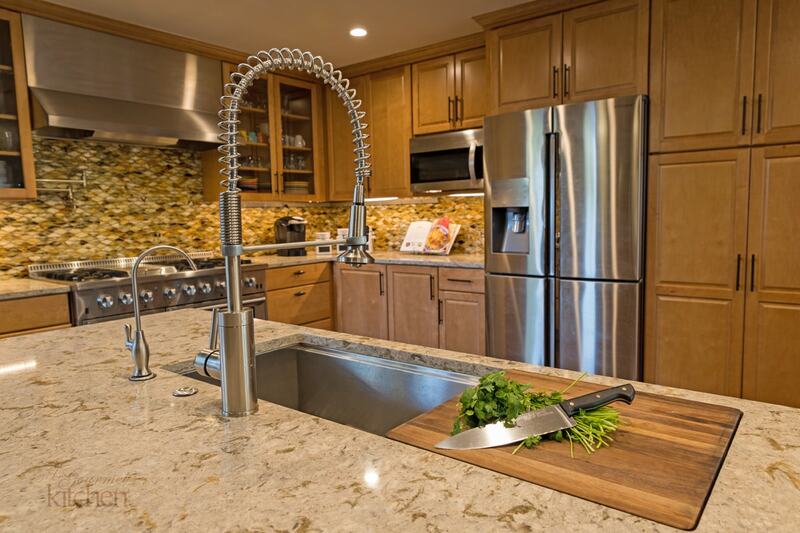 The island also features angled power strips that fit neatly under the edge of the countertop. A Samsung refrigerator, LG built-in microwave, and Bosch dishwasher complete the food storage and cooking area of this kitchen design. Ample lighting brightens up the space, including recessed lights and pendants over the island. Undercabinet lighting highlights the stunning backsplash and offers additional task lighting in the cooking area. 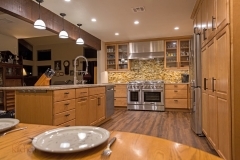 This is a kitchen design that will be the center of life for years to come!